Johns Hopkins University is a highly selective school with an acceptance rate of 9.9%. To apply, students can use the Common Application, Universal Application, or Coalition Application. JHU has an Early Decision program that can improve admission chances for students who are sure the university is their top choice school. Johns Hopkins has multiple campuses in the Baltimore area, but the majority of undergraduate programs are housed in the red-brick Homewood Campus in the northern part of the city. Johns Hopkins is best-known for its professional programs in health sciences, international relations, and engineering. However, prospective students shouldn't underestimate the quality of the liberal arts and sciences. With a multi-billion dollar endowment and 10-to-1 student/faculty ratio, the university is a teaching and research powerhouse. On the athletic front, the Johns Hopkins Blue Jays compete in the NCAA Division III Centennial Conference. The university fields 12 men's and 10 women's varsity sports. The university's many strengths have earned Hopkins a chapter of Phi Beta Kappa and membership in the American Association of Universities. JHU is ranked among the top Maryland colleges, top Middle Atlantic colleges, and top national universities. Considering applying to Johns Hopkins? Here are the admissions statistics you should know, including average SAT/ACT scores and GPAs of admitted students. During the 2017-18 admissions cycle, Johns Hopkins University had an acceptance rate of 9.9%. This means that for every 100 students who applied, 9 students were admitted, making Johns Hopkins' admissions process highly competitive. Johns Hopkins University requires that all applicants submit either SAT or ACT scores. During the 2016-17 admissions cycle, 43% of admitted students submitted SAT scores. This admissions data tells us that most of JHU's admitted students fall within the top 7% nationally on the SAT. For the evidence-based reading and writing section, 50% of students admitted to Johns Hopkins scored between 720 and 770, while 25% scored below 720 and 25% scored above 770. On the math section, 50% of admitted students scored between 730 and 800, while 25% scored below 730 and 25% scored a perfect 800. Applicants with a composite SAT score of 1570 or higher will have particularly competitive chances at Johns Hopkins. Johns Hopkins University does not require the SAT writing section. Note that JHU participates in the scorechoice program, which means that the admissions office will consider your highest score from each individual section across all SAT test dates. At JHU, SAT Subject tests are optional. Johns Hopkins University requires that all applicants submit either SAT or ACT scores. During the 2016-17 admissions cycle, 56% of admitted students submitted ACT scores. This admissions data tells us that most of JHU's admitted students fall within the top 2% nationally on the ACT. 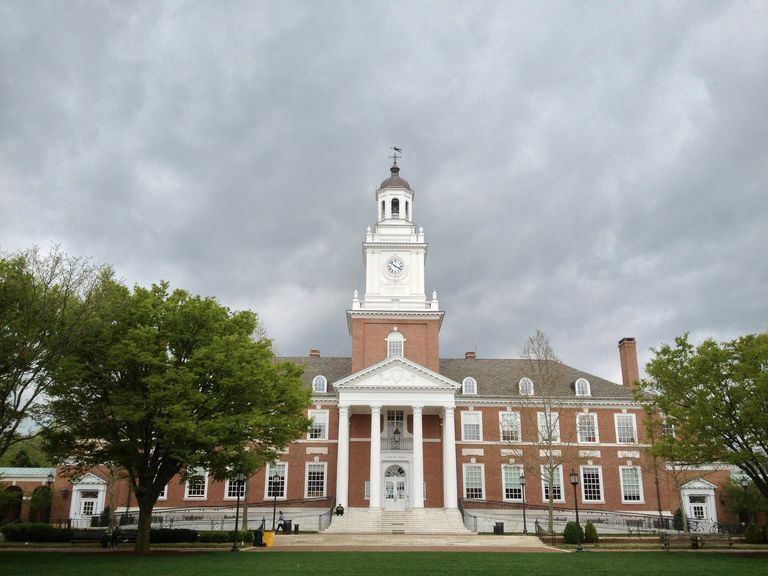 The middle 50% of students admitted to Johns Hopkins received a composite ACT score between 33 and 35, while 25% scored above 35 and 25% scored below 33. Johns Hopkins does not require the ACT writing section. Unlike many universities, JHU superscores ACT results; your highest subscores from multiple ACT sittings will be considered. In 2018, the mean, unweighted high school GPA of Johns Hopkins incoming freshman class was 3.93%. This information suggests that most successful applicants to Johns Hopkins University have primarily A grades. Johns Hopkins Applicants' Self-Reported GPA/SAT/ACT Graph. Data courtesy of Cappex. The admissions data in the graph is self-reported by applicants to Johns Hopkins University. GPAs are unweighted. Find out how you compare to accepted students, see the real-time graph, and calculate your chances of getting in with a free Cappex account. Johns Hopkins University, which ranks among the 20 most selective universities in the country, has a highly competitive admissions pool with a low acceptance rate and high average SAT/ACT scores. However, JHU has a holistic admissions process involving other factors beyond your grades and test scores. A strong application essay and glowing letters of recommendation can strengthen your application, as can participation in meaningful extracurricular activities and a rigorous course schedule. Students with particularly compelling stories or achievements can still receive serious consideration even if their test scores are outside JHU's average range. If you're applying to Johns Hopkins, you should consider the school a reach even if you have exceptional grades and standardized test scores. The graph above illustrates why. Many students with unweighted "A" averages and extremely high standardized test scores were still rejected by Johns Hopkins University. All admissions data has been sourced from the National Center for Education Statistics and Johns Hopkins University Undergraduate Admissions Office.